College access and equity pioneer Franklin & Marshall College has more than tripled its percentage of low-income Pell Grant students since 2008. These students, many of them the first in their families to attend college, made up just 5 percent of the class of 2012 but have accounted for an average of 20 percent of the past three freshman classes and will represent 17 percent of graduates who receive their diplomas at the school’s May 13 commencement. At the same time, the college is a pivotal force behind a larger higher-education collaborative working to enroll an additional 50,000 qualified low-income students at the nation’s top 270 college and universities by 2025. “There’s great talent, but they need aid and they need a bridge. 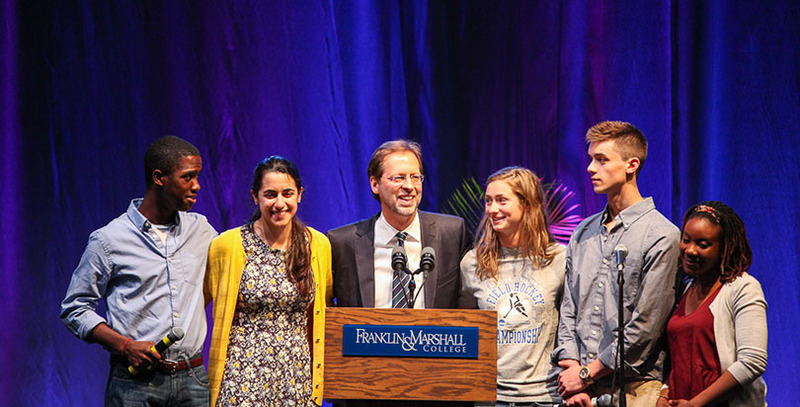 To say that low-income students need so much support that you have to create a second college for them is a tremendous disincentive for schools to do the work,” F&M President Daniel Porterfield said during a recent interview with The 74. “It’s not that hard. All 18-to-22-year-olds need support,” he added, citing his own college-age daughters. Porterfield sees this shifting of resources away from so-called merit aid and toward need-based financial aid, bolstering students who qualify for federal Pell Grants, as the most important academic investment a higher-learning institution can make. He said it has strengthened F&M’s applicant pool, brought more prestigious fellowships and recognition to the college than ever before, diversified its classrooms, and enriched campus culture. Porterfield said these high-achieving, low-income students — the strivers, as he likes to call them — are traditionally underrepresented in the country’s best colleges and universities, yet students of color from poor families now make up a majority of the nation’s K-12 population. Without their academic success, he said, the U.S. will not be able to thrive and compete in a fast-paced, tech-driven, knowledge-based global economy. F&M has been able to tap into a steady stream of competitive, college-ready students who face financial hardship because of K-12 partnerships it has built over the years with places like KIPP Public Charter Schools and the POSSE Foundation. F&M also seeds the population by offering a three-week intensive summer college prep program for students from underserved communities entering their senior year. Those chosen have all their expenses paid and live at the college while they take seminar-style courses, attend workshops geared toward navigating the college admissions process, and meet in small groups with peers, staff, and faculty, many of them first-generation college graduates. There are also social and cultural events and guest speakers. The program gives the teens what Porterfield calls the “college knowledge” that first-generation students might be missing and can struggle with once they find themselves on a campus far from home. More than 90 percent of the high schoolers who went through the program enrolled in a four-year college, whether F&M or somewhere else. “The program helped me develop skills like networking, learning how to cope with different opinions, learning how to interact with different people from different parts of the country, people who I may not have met otherwise,” said Armoni Foster, a KIPP New Jersey senior who attended the college prep program last summer and is headed to Duke University in North Carolina this fall. The $1 million donation from Mehlman will focus a similar high-impact level of support on 10 incoming F&M freshmen this year, and 30 over the next three years, who have persevered through some serious challenge — poverty, disability, discrimination, or illness — while trying to figure out how to replicate their resilience for other struggling students. Franklin & Marshall’s successful model is being scaled in the bigger, more ambitious effort to enroll 50,000 low-income qualified students at 270 top schools by 2025. The American Talent Initiative, funded by Bloomberg Philanthropies, has grown from 30 colleges and universities who made the initial access and equity pledge when it was announced in December 2016 to more than 60. “If we’re serious about promoting social mobility in America, we need to ensure that every qualified high school student in the U.S. has an opportunity to attend college … This is a vital first step towards creating a more meritocratic society,” Michael R. Bloomberg, founder of Bloomberg Philanthropies and former three-term mayor of New York City, said in a press release. RaeVaughn Williams, who entered F&M as a POSSE scholar, is not surprised by Porterfield’s commitment and calls him “a perfect figurehead for what higher education should aspire to be.” The class of 2016 graduate is now assistant director of admissions at Muhlenberg College in Allentown, Pennsylvania, and believes in the benefits that providing full, need-based aid can bring. Porterfield sees F&M’s mission as having the potential to heal some of the deep divisions the country now faces. Disclosure: Bloomberg Philanthropies also provides support to The 74.